A COUPLE were lucky to escape unhurt after they were forced to climb 40 feet up an unstable cliff face to escape stormy high-tide waves. The husband and wife, who were on holiday at Watergate Bay, were trapped by the incoming sea as they strolled along the beach towards Porth at 3pm last Wednesday. They tried to wade to safety with their pet dog but were pummelled back against boulders at the foot of the cliffs. Edging up the scree bank, the scene of a recent rock fall, the pair from Preston began blowing on their dog whistle, desperately hoping someone might hear them. Luckily a passer-by heard the high-pitched noise and spotted them, immediately alerting a second onlooker, 66-year-old Reverend Malcolm Rooke, who called 999. 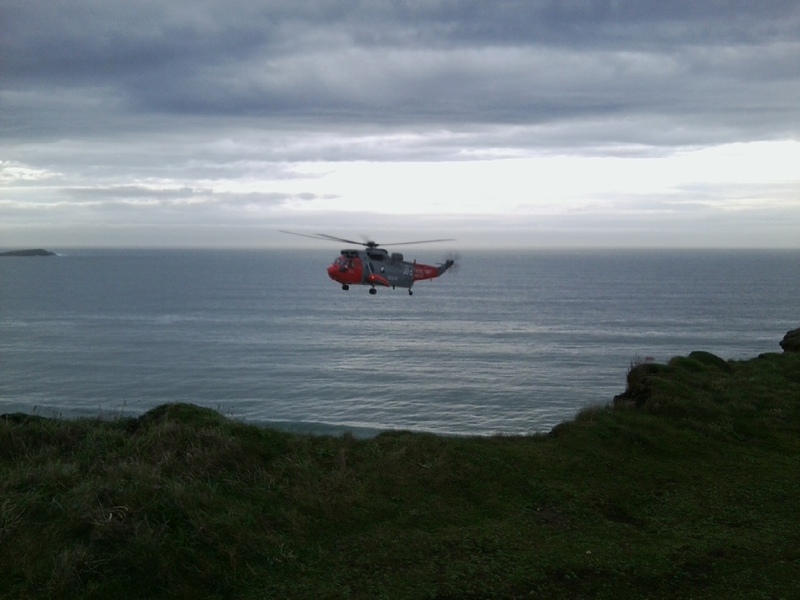 Lifeboats were dispatched but could not get close enough to the cliff, leaving the job in the hands of the coast guards. But with the cliff face proving too dangerous to abseil, the cliff rescue team called in the search and rescue helicopter from RNAS Culdrose. The team's Dave Bulley told the Cornish Guardian: "This was where thousands of tonnes of rock recently fell from the cliff. Coast guards decided that a cliff rescue would be extremely hazardous because of the dangerous surface and requested the assistance of the helicopter." He said the crew had been forced to carry out a daring winch-rescue from 200ft as the pilot did not want to risk dislodging more rock with the downdraft from the helicopter's rotors. "The couple were incredibly grateful and lucky that someone heard them," said Mr Bulley. "It was a big sea with about 6ft of surf. One had a medical condition and they were both wet and cold. They would have had to wait between four and six hours for the tide to go back out." Reverend Malcolm, a local spiritual healer, said: The woman was in a bit of a state, as you can imagine, but she waved thanks to us. It can be a dangerous place. You have to be aware that the tide can come in very quickly along there and there's nowhere to escape to. It was good to see a positive outcome though without anyone needing to go to hospital. It's always nice to help people. The news comes around two weeks after an Australian couple and their dog were rescued by the RNLI after being cut off by the tide on the same stretch of beach.